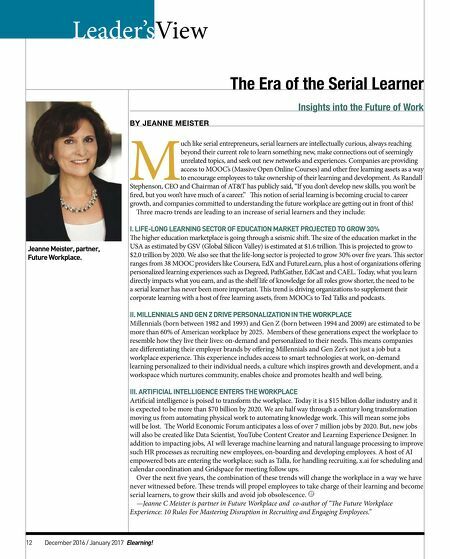 View Leader's Insights into the Future of Work BY JEANNE MEISTER M uch like serial entrepreneurs, serial learners are intellectually curious, always reaching beyond their current role to learn something new, make connections out of seemingly unrelated topics, and seek out new networks and experiences. Companies are providing access to MOOC's (Massive Open Online Courses) and other free learning assets as a way to encourage employees to take ownership of their learning and development. As Randall Stephenson, CEO and Chairman of AT&T has publicly said, "If you don't develop new skills, you won't be fired, but you won't have much of a career." is notion of serial learning is becoming crucial to career growth, and companies committed to understanding the future workplace are getting out in front of this! ree macro trends are leading to an increase of serial learners and they include: I. LIFE-LONG LEARNING SECTOR OF EDUCATION MARKET PROJECTED TO GROW 30% e higher education marketplace is going through a seismic shi. e size of the education market in the USA as estimated by GSV (Global Silicon Valley) is estimated at $1.6 trillion. is is projected to grow to $2.0 trillion by 2020. We also see that the life-long sector is projected to grow 30% over five years. is sector ranges from 38 MOOC providers like Coursera, EdX and FutureLearn, plus a host of organizations offering personalized learning experiences such as Degreed, PathGather, EdCast and CAEL. Today, what you learn directly impacts what you earn, and as the shelf life of knowledge for all roles grow shorter, the need to be a serial learner has never been more important. 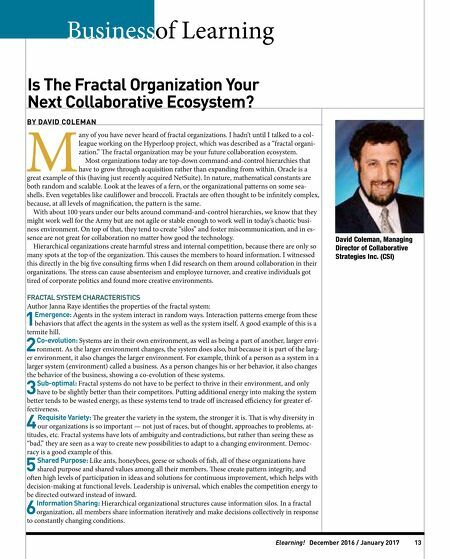 is trend is driving organizations to supplement their corporate learning with a host of free learning assets, from MOOCs to Ted Talks and podcasts. II. MILLENNIALS AND GEN Z DRIVE PERSONALIZATION IN THE WORKPLACE Millennials (born between 1982 and 1993) and Gen Z (born between 1994 and 2009) are estimated to be more than 60% of American workplace by 2025. Members of these generations expect the workplace to resemble how they live their lives: on-demand and personalized to their needs. is means companies are differentiating their employer brands by offering Millennials and Gen Zer's not just a job but a workplace experience. is experience includes access to smart technologies at work, on-demand learning personalized to their individual needs, a culture which inspires growth and development, and a workspace which nurtures community, enables choice and promotes health and well being. III. ARTIFICIAL INTELLIGENCE ENTERS THE WORKPLACE Artificial intelligence is poised to transform the workplace. Today it is a $15 billon dollar industry and it is expected to be more than $70 billion by 2020. We are half way through a century long transformation moving us from automating physical work to automating knowledge work. is will mean some jobs will be lost. e World Economic Forum anticipates a loss of over 7 million jobs by 2020. But, new jobs will also be created like Data Scientist, YouTube Content Creator and Learning Experience Designer. In addition to impacting jobs, AI will leverage machine learning and natural language processing to improve such HR processes as recruiting new employees, on-boarding and developing employees. A host of AI empowered bots are entering the workplace; such as Talla, for handling recruiting, x.ai for scheduling and calendar coordination and Gridspace for meeting follow ups. Over the next five years, the combination of these trends will change the workplace in a way we have never witnessed before. ese trends will propel employees to take charge of their learning and become serial learners, to grow their skills and avoid job obsolescence. —Jeanne C Meister is partner in Future Workplace and co-author of "e Future Workplace Experience: 10 Rules For Mastering Disruption in Recruiting and Engaging Employees." The Era of the Serial Learner Jeanne Meister, partner, Future Workplace. 12 December 2016 / January 2017 Elearning!